Goodwood in West Sussex was the perfect place to cook this dish. The estate has amazing pasture and produces great lamb and beef, plus it holds one of the best events in Britain – the Goodwood Revival, celebrating all things from the 1950s and 60s. It’s like stepping back in time, with 200,000-plus visitors and food harking back to when the Wimpy was the first burger brought to these shores. Start by making the cucumber pickle. Pour the vinegar into a pan, add the sugar and salt and heat gently to dissolve them. You may need to stir the mixture every now and then. When they’ve dissolved, add the cucumber slices and remove the pan from the heat. To make the burgers, put the mince into a bowl and season well. Mix together with your hands then divide into 4 even portions and shape each portion into a burger-shaped round. Push your thumb into the centre of one of them to make a hole (making sure you don’t push all the way through) then fill with a piece of mozzarella. Cover the hole over with mince to seal it in. Do the same with the other burgers and remaining mozzarella. Drizzle a large, flat griddle pan with oil. Place over a medium heat and, when hot, lay the burgers in the pan. Reduce the heat and fry the burgers gently for 5 minutes. Flip them over and continue to cook them for a further 5 minutes. Toast the brioche buns sliced-side down in the same pan. 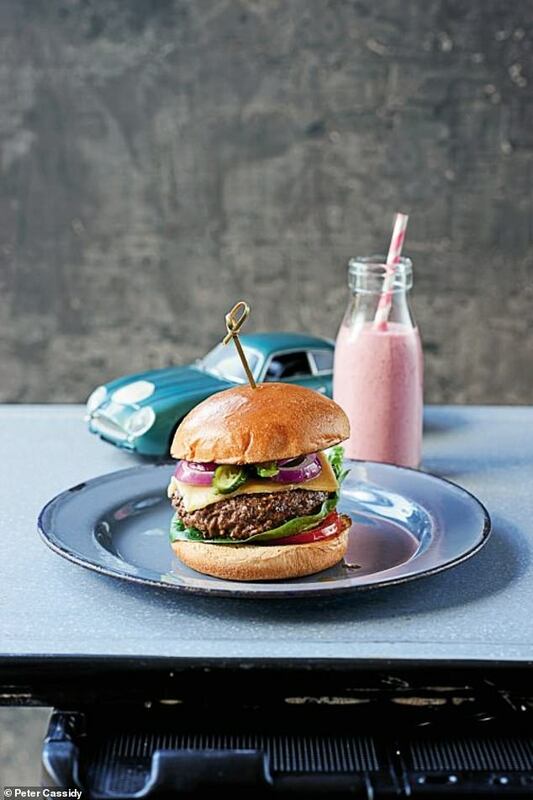 To serve, place each brioche base onto a plate and top with slices of tomato and lettuce leaves, then a burger. Add a slice of Monterey Jack cheese, some onion and pickled cucumber. Pop the bun tops on and secure with a stick. To make the shakes, whisk the milk and the raspberry purée together in a jug. Pour into 4 glasses and serve alongside the burgers. The Good Doctor season 2, episode 15: Why is The Good Doctor not on this week?